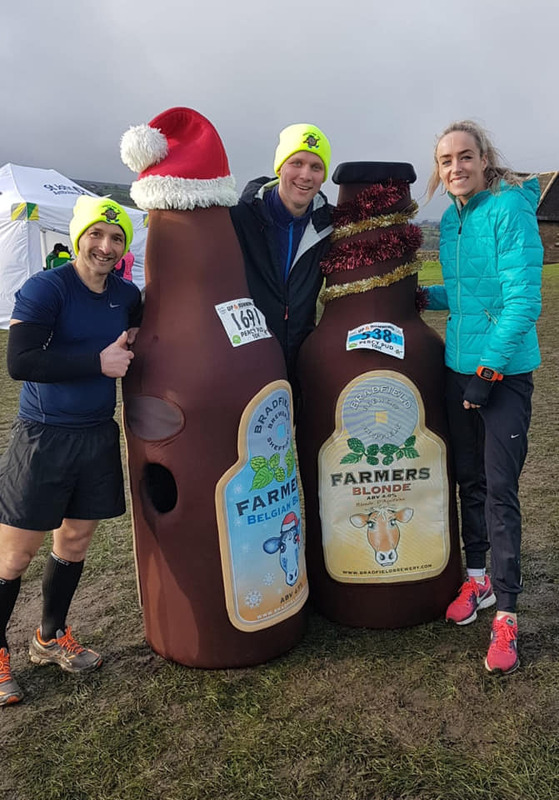 Farmers Blonde Bottle and Farmers Belgian Blue bottle costumes went neck and neck in this year’s Percy Pud 10K! Organised by Steel City Striders, the 10k race around Bradfield is quite a grueler with sneaky twists and turns and a hilly bit or few! Farmers Blonde is a regular runner of the race but this year he was joined by his new partner in crime Belgian Blue. It was a tight race for the pair but eventually Farmers Blonde took the lead and crossed the line as the front runner for the bottles with a time of 60mins, 59secs! And only a few minutes behind, also with an impressive time, was Belgian Blue at 63 mins,37 secs. Also running the race was a member of the Bradfield Brewery team, Josie Gill. Storming ahead of the bottles to scoop a time of 55min:15sec. This winter race marks the start of the festive season and everyone crossing the finish line is rewarded with a Christmas Pudding & Wooly Hat!